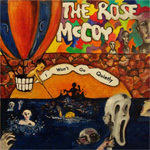 The Rose McCoy have put out a true diamond in the rough with I Won't Go Quietly. It really goes to show what a band can do when they screw the conventional lines that define a genre of music and play two completely different types of music in order to bring out something completely new. This is metalcore with depth. This is pop with depth. Standard metalcore screaming vocals are all balanced out with sung Patrick Stump/Brendon Urie style pop vocals, giving each song a depth not seen in conventional metalcore. Furthermore, each song has a good sense of progression, building upon itself instead of remaining flat and dull like other bands in the genre. Lyrics also appear to be thought out and have genuine meaning without relining on any common metalcore or pop platitudes. While the first five tracks have a basic metalcore sound, Inside the White Lines needs to be given special mention for being a 100% pop rock song. It's an incredible change of pace that still fits with the tone of the album. It's utterly fantastic that a band can make pop rock and metalcore blend together in such a fashion. My only complain is the brevity of the album. Six songs seems a little slim and I wouldn't have minded a few more popish songs thrown in to help supplement Inside the White Lines. I Won't Go Quietly deserves a lot of praise for what it does. Pulling off a combination of Panic! at the Disco style pop and metalcore is an amazing feat. Although it's mass appeal is questionable, there's no doubt in my The Rose McCoy are destined for greatness.